The Supreme Court of Pakistan has lifted a ban on 2008 Mumbai attack mastermind Hafiz Saeed’s Jamaat-ud-Dawa (JuD). 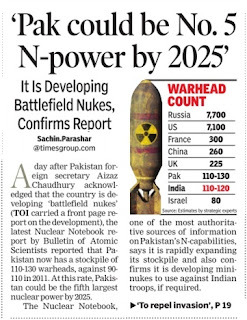 This was revealed in a report issued in connection with a non-government organisation (NGO) case. The ban was lifted on the Jamaat-ud-Dawa and two other organisations a week ago. The Alkhter Trust and Al-Rashid Trust are the other two organisations from whom the ban has been lifted, the Daily Times reports. The report has suggested that 53 NGOs, including US-based Save the Children Bahwalnagar have been declared controversial. The Punjab Government had appealed to the federal government to resolve the issue of registration of seminaries. A committee constituted by the Federal government has stopped the matter of seminaries so far, the daily national reported. Keeping in mind growing threats from sea, the Navy has carved out a separate command dealing exclusively with the 1,214 km-long Gujarat coast and will station four warships at Porbandar at the newly set up land base – the INS Sardar Patel. Till now, the Maharashtra and Gujarat Naval area were under one command. It has been divided to make two separate headquarters under flag officers of Maharashtra Naval area and Gujarat area, respectively. The combined area ran from Ratnagiri located south of Mumbai to the Rann of Kutch in Gujarat bordering Pakistan. The division of the Naval areas was marked by Rear Admiral Satish Namdeo Ghormade, who assumed the charge of Flag Officer Maharashtra area. Rear Admiral Murlidhar Sadashiv Pawar will officiate as Flag Officer Gujarat area. Admiral Pawar will be stationed at Ahmadabad while the Naval Officer in charge for operation will be based in Porbandar. Sources said the Gujarat area was formed as some of the largest crude oil refineries, crude oil landing ports and ship building companies are based there. The Navy has stationed its men and officers for operations at Bhavnagar Okha (Dwarka) Veraval and Kandla among other places. 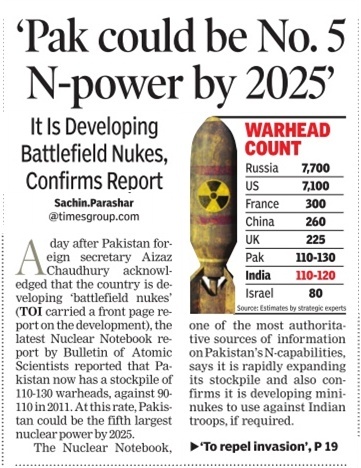 Notwithstanding Prime Minister Narendra Modi’s ‘Make in India’ rhetoric, Indian security and defence manufacturing companies claim the government is favouring foreign firms during the procurement process. 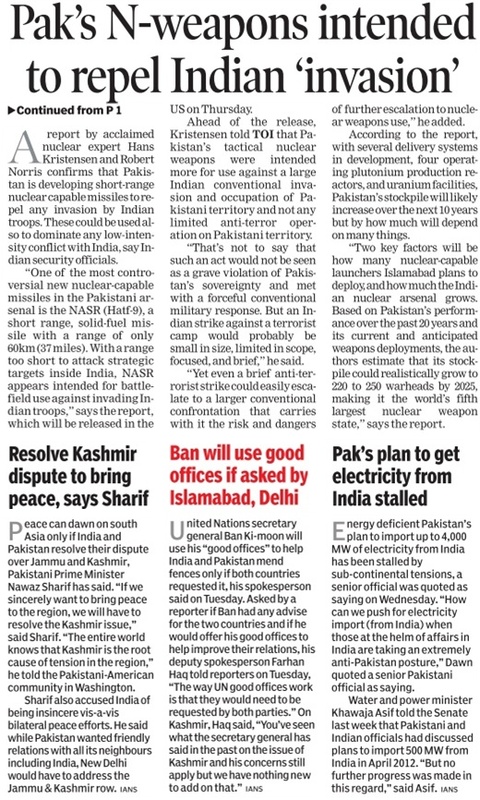 Sanjeev Sehgal, chairman of an industry association, said Indian firms were finding the terms and conditions of tenders for security equipment restrictive. The tenders require a firm to have prior experience, even though several Indian companies are fairly new. “Most of these conditions don’t support the domestic market. Sometimes the tender will require international certification such as the United Laboratories (UL) standard. If I am not supplying my products to the US, why should I obtain this certificate?” asked Sehgal. He said under the preferential market access (PMA), at least 30 per cent of the government’s requirement were reserved for the domestic sector. It is 100 per cent for CCTV and alarm systems and 50 per cent for biometric systems. “But these preferences are of no use if there is a restrictive tender,” he said. Sehgal’s company supplied video surveillance equipment to the Airports Authority of India (AAI), the Indian Army and the Indian Air Force (IAF). But two months ago, an AAI tender for CCTV cameras at the Ranchi airport listed a few companies, most of them foreign, from which certain parts of the system should be procured. There are also tenders for installing video surveillance at certain banks, which stipulated the need for UL certificates. MK Bhandari, the CEO of another security company, said the availability of raw material such as integrated circuits and microcontrollers was a major problem in India. “Due to this, Indian firms are not able to bid the lowest as our manufacturing cost is high. In more than 50 per cent of tenders, we face this problem,” said Bhandari. 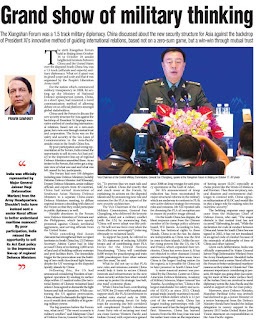 Ashok Atluri, head of a company making simulators for the armed forces, said when there was an indigenously designed and manufactured product, the government should discourage the import of a similar product. “Foreign firms are given preferences in their own country. Nevertheless, the current government is pro-Indian industry and there will be changes to encourage domestic companies to invest in R&D as also develop world-class products,” he hoped. Emails queries to the Ministries of Defence and Home Affairs elicited no response. Defence Ministry spokesperson Sitanshu Kar told The Tribune that the ministry would not respond to these allegations and required evidence to comment on it. A government official, on the condition of anonymity, said all procurements were transparent and ensured a level-playing field for all firms. “We will go for a company which can perform and has credibility. Even in the absence of past experience, there has to be some credibility. Some vendors win tenders but later cannot complete the work, like in integration projects,” said the official. A militant of the Hizbul Mujahideen was killed and three jawans of the Army’s counter-insurgency unit were injured in a gunfight in north Kashmir’s Baramulla district on Wednesday. The police said the gunfight erupted in Bangam Kunzer village, nearly 30 km from here, when troops of the Rashtriya Rifles battalion and the Special Operations Group of the J&K Police launched a search operation after receiving information about the presence of two militants in the area. 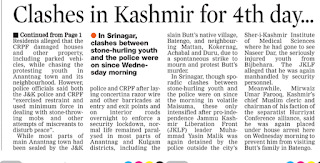 “Around 7 am when searches were being carried out, the militants hiding in the area tried to break the cordon and opened indiscriminate fire on the forces triggering a gunfight. In the gunfight, one militant was killed and three soldiers were injured,” a source said. The injured jawans were evacuated to the Army’s Srinagar-based 92 Base Hospital for treatment. The condition of one of the injured is stated to be critical. 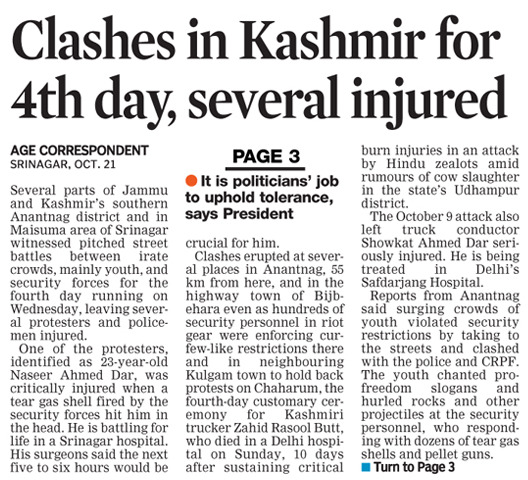 An Army spokesman said the soldiers sustained injuries while ensuring no damage was caused to the locals of the area. The slain Hizb militant has been identified as Nisar Ahmad Wani, a resident of Adipora Kunzer. Wani had joined the group earlier this year and was a close associate of slain Hizb commander Fayaz Ahmad Bhat, whose bullet-riddled body was recovered near Tangmarg town last month. After Fayaz’s death, Wani was looking after the outfit in the area and was working in close coordination with south Kashmir-based militant commander Zakir, the police said. The exchange of fire between the two sides continued for almost an hour. Later, searches were carried out in the area but no fresh contact with the militants was established. The encounter took place close to the national highway that connects Srinagar with the tourist resort of Gulmarg. 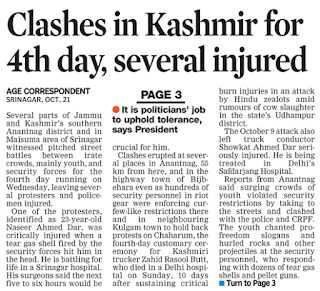 Wani had a narrow escape immediately after he joined militancy. On April 2, Wani along with Fayaz had managed to escape a cordon at Hardespora in Pattan in which an Army jawan and a special police officer (SPO) of the J&K Police were killed. Wani, the police said, was instrumental in luring local boys to join militancy. “He was also involved in intimidating local panches and sarpanches,” a police officer said. The BSF today said that post the Director General-level meeting between the BSF and the Pakistan Rangers in September, there had been peace along the international border. He, however, said the terror infrastructure was intact across the border and terrorists had been kept in various launching pads. “Post the DG-level meeting between the two countries last month, there is peace on the international border and no such activity has been noticed which can arouse our concern. 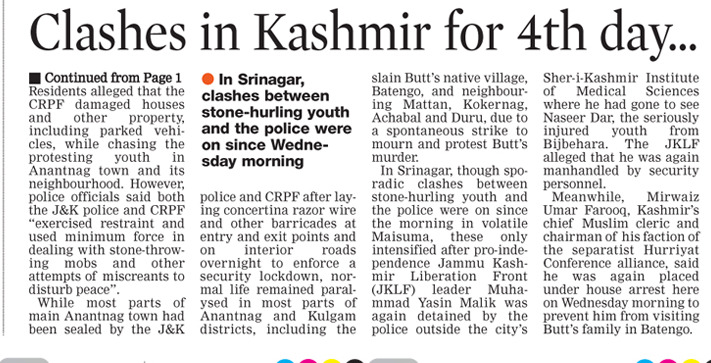 But we are not taking anything lightly as 24x7 vigil is on,” said RK Sharma, Inspector General (IG), BSF, Jammu Frontier. The BSF IG was responding to media queries on All India Police Day and Martyrs Day here this morning. 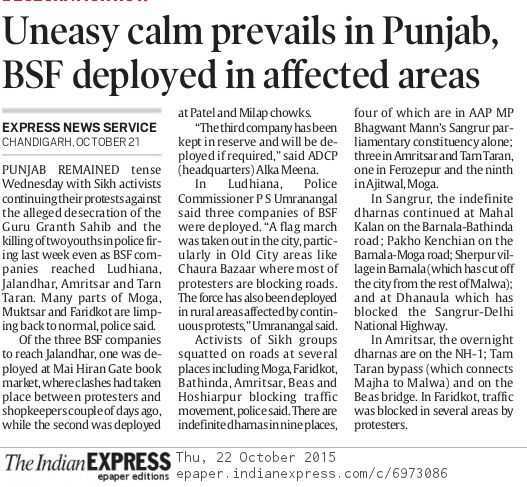 He said the BSF personnel on the ground had been asked to remain alert. 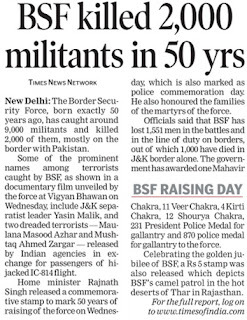 “We are carefully examining every activity across the border and will take appropriate action wherever required, but terrorists are still active and have been kept in various launching pads,” said the BSF IG. He said immediately after the DG-level meeting, there was one suspected intrusion attempt. 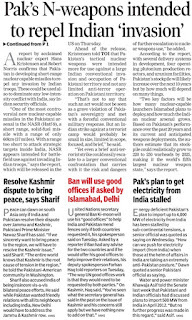 “We had lodged a strong protest with Pakistan, clearly telling them that it went against the mandate of the meeting. We have told them that there should be no movement in the night close to the international border. Barring that incident, no further intrusion bids have occurred,” he said. 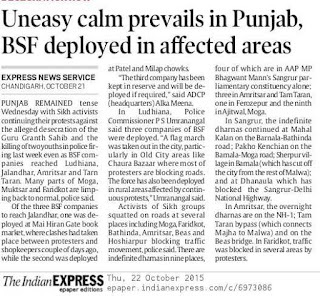 As winter has started setting in, the IG said the BSF had already shifted into winter posture. In winter, when snow closes mountain passes on the rugged and hilly terrain of the Line of Control, Pakistani militants shift their focus to the international border, largely a plain area. “The BSF has put in place a winter strategy. It’s also a festive season in Jammu. We have beefed up security, including deployment of more men and additional surveillance gadgets. Every inch of the border is under strict vigil,” he said. 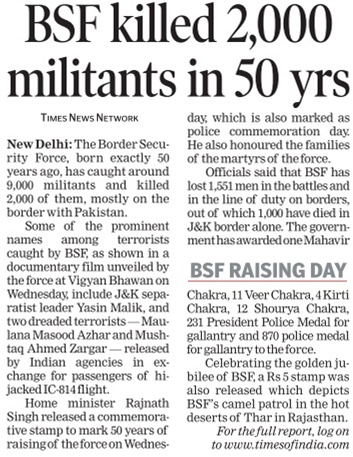 To a specific query on a group of militants being taught ‘Gurmukhi’ opposite the Hiranagar and Bamiyal areas by the ISI so as to avoid their detection once pushed into the Indian side, the IG said such inputs were also available with the BSF. “The BSF and other sister agencies are looking into it minutely. If we come across such suspects, apt and swift action will be taken, but we never lower our guard on the international border,” added Sharma. 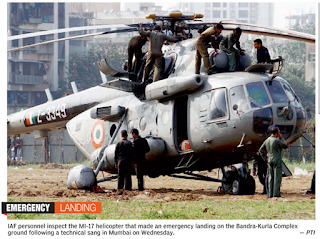 An Indian Air force (IAF) MI-17 helicopter on a routine sortie made an emergency landing at MMRDA Ground in the Bandra Kurla Complex today after developing a technical snag. According to a spokesman of the Ministry of Defence, there were two passengers in addition to the pilot and the co-pilot. All four of them are safe. The helicopter, however, suffered some damage after one of its wheels got entangled in the soft mud of the grounds. The chopper had taken off from the Santa Cruz airport just a few minutes before it was forced to touch down. A technical team of the IAF has been sent to the MMRDA grounds to carry out an assessment of the chopper and remove it from the grounds. The suddenly landing of the chopper attracted scores of onlookers from the offices nearby and the police had to be called in to cordon off the area. On most days, there are trade fairs and exhibitions on this ground. Today, however, there was no event scheduled and the ground was almost empty. According to the local police, there would have been casualties had there been a large number of people around. The Indian Army plans to fast track the upgrade of 1,000-1,200 of its ageing, licence-built Russian BMP-2/2K 'Sarath' infantry combat vehicles (ICVs) to BMP-2M standard by enhancing their offensive capabilities and fitting them with more powerful engines. The estimated INR130 billion (USD2 billion) BMP-2 retrofit has acquired operational urgency after the long-delayed INR1 trillion Future ICV (FICV) programme, now delayed by over five years, was postponed once more. In late September the Ministry of Defence (MoD) deferred the long-extended deadline for 10 Indian companies to submit their project reports for the FICV project by three months to mid-January 2016. It did so at the behest of the potential vendors, which were seeking clarification on the FICV project with regard to several of its overall qualitative requirements (QRs).